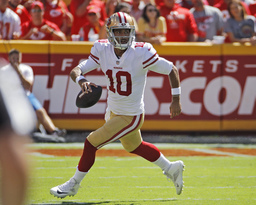 Once the season begins Sept. 8 in the opener at Tampa Bay, Garoppolo believes the only difference will be the brace he will wear on his surgically repaired left knee. The 49ers are counting on Garoppolo being back to the player he was when they acquired him during the 2017 season from New England and he won his first five starts with the team to end that season. He was rewarded with a five-year, $137.5 million contract that offseason to be San Francisco's franchise quarterback only to go down with the season-ending ACL injury in a Week 3 loss at Kansas City last season. Garoppolo was helped in his rehab by the fact that running back Jerick McKinnon tore his ACL earlier in September and was a good guide and partner during the process that has continued throughout the offseason. Garoppolo said it took some time to get the trust back in his knee, but now feels comfortable running and throwing the ball. Having a healthy Garoppolo and McKinnon will be key this season for the 49ers, who are coming off a 4-12 season in coach Kyle Shanahan's second year with the team. Shanahan let the players know as they gathered this week for the start of the offseason program that improvement is necessary. Buckner was one of the few bright spots for the Niners last season with a career-high 12 sacks. The seventh overall pick in the 2016 draft proved he was a foundation piece for the 49ers. Now the team will have to start planning on how to keep Buckner. He is eligible for a contract extension this summer if the 49ers want to lock him up long term before he can become a free agent following the 2020 season.